This last week I have been receiving SPAM in my comments. Blogger, like other blog sites, has a system set up to help prevent this, but it doesn’t always work. Even though there is no rule book on blogging etiquette, there are well known courtesies, especially if it is a professional blog like real estate. The recent offender is another real estate agent who has left at least 5 comments. Normally this wouldn’t be a problem as I love comments from my readers. However it does become a problem when each message is the same, with a link to his site. He is obviously trying to get search engines to follow his site and give him some SEO (search engine optimization). The only problem is that he is committing blogging no-no number one by spamming me. My only solution is to reject his comments. So if you have a blog, don’t let comments rule your life. Comments are not your main concern, but posting quality content should be. 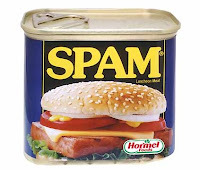 If you get SPAM like I described, don’t feel bad by deleting their comments. It will make you look more professional by not cluttering a good post with bologne.